Sushma asked him to take out good muhurta for them. Dasharath asked whose marriage? Shalini said Viplav and Dhaani. Dasharath said no. Shalini tried to speak, but Dasharath asked her to stop. Shalu said remarriages happen in serials. Sushma asked him to take out a solution. Dasharath said ok.
Next morning Dhaani did Viplav’s Tilak and showed his medicines. Viplav smiled looking at her and said he don’t remember which medicine to take. Dhaani showed the flag colors medicine and asked him to remember. Viplav said he didn’t want to recover fast; else his wife would not sit with him. Dhaani asked him to get well. Viplav asked the extent of closeness? Dhaani got shy. Before she could kiss him, he kissed her, and they shared some romantic moments. Dhani said there would be no distance between them. Sushma asked Shalu to bring Dhaani. Dasharath said no need and took out mahurat of marriage. He said there was a good mahurat after two days. The old lady asked why they haven’t told her about the wedding. Dasharath, Sushma, Kanak, and Shalini were shocked on seeing her. Shalu wished her and called her Dadi Bua. She said you have taken out mahurat for Viplav’s marriage and asked whether he forgot his promise. She stated that they hadn’t cared about her. Dasharath said that he was guilty that he didn’t tell her, but they were discussing Shalu’s marriage. Shalu was surprised. Dhaani applied ointment in Viplav’s wounds and put a bandage. Dadi Bua questioned Shalu whether she didn’t get marry till then. Dadi Bua asked about Viplav. Shalu said he was in the room. Dadi Bua wondered how her son looks alike. She asked Kanak why she was silent. Dasharath stopped Dadi Bua and said he will call Viplav there. 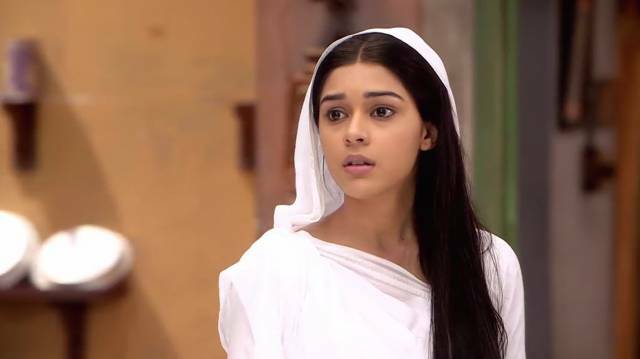 Dhaani cared for Viplav. Ishq Ishq played. Viplav moved his fingers in her hair and showered flowers. Dhaani smiled. Isshq Kaa Raang Safedd played. They kissed on each other cheeks and eyes. Dasharath asked Dadi Bua to meet Viplav later. She asked what they were hiding and asked him to tell truth. Everyone was silent. Kanak said he might be sleeping then. She opened the door and hugged him happily. Viplav felt pain in his wound. Dadi Bua asked Dasharath how did that happen and scolded him. Viplav said it was his mistake. Viplav told that he was taking medicine on time and said he would hug her like a filmy hero the day later. Dadi Bua asked why he was alone in the room. Viplav told that Dhani was there with him. Dasharath and Kanak are tensed. Dadi Bua asked who she was. Viplav was about to tell that she was his wife, but just then Dasharath said she is a nurse. Viplav and Dhaani were shocked. Dasharath said she was Aaya from the hospital to take care of Viplav. Dhaani got upset.